I’ve started this blog as a way to tell the stories behind the images I post. While I always try to tell a story with my images, there is often a behind the scenes story that is more than the photo alone can tell. I will do my best over this and future posts to tell stories that accompany these images. For my first post, I decided to choose an image that warms my heart every time I see it, and is also one of my most popular images to date. 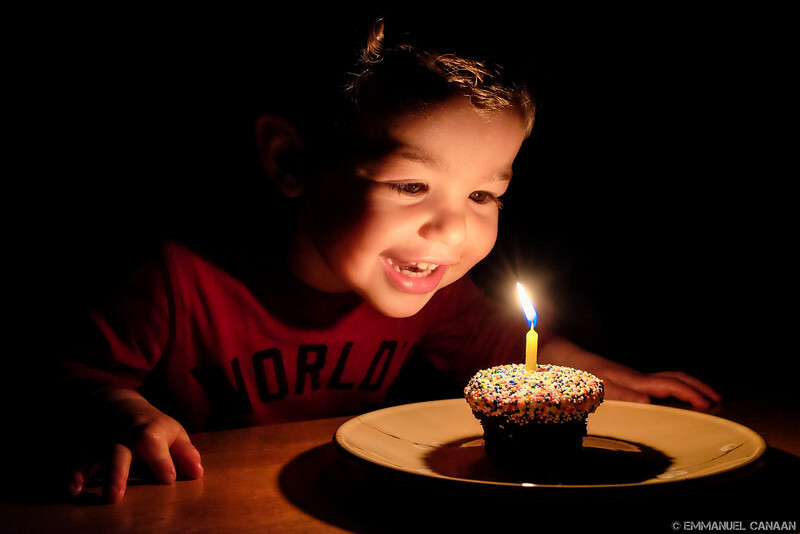 This is a photo of my son on his 2nd birthday. His party had taken place three days prior, along with a cake, presents, balloons, the works. Despite that, we still wanted his actual birthday to be something special. So, after his favorite dinner of mac and cheese, we trotted out a cupcake (well also a second cupcake for his four-year-old brother so we wouldn’t have a thermonuclear tantrum in our dining room). I wasn’t expecting him to do much more than immediately smash the cupcake and attempt to shove it in his mouth in a single bite. Grabbing my camera was actually an afterthought. While I stood by with the camera, my wife dimmed the lights, lit the candle, and walked out the most important thing in my son’s world at that moment. Knowing that the X100S is exceptionally sharp at f/4, I dialed the aperture there, left the shutter speed on auto, and let the ISO float up to 3200. Being the brilliant photographer that I am, it was only at this moment that I realized I’d be shooting at very slow shutter speeds and needed something to stabilize the camera. I frantically looked around for anything to set my camera on. The closest thing I found was…an empty tissue box. Damn. It would have to do as I had mere seconds to capture the genuine emotion on my son’s face. I immediately started snapping pictures. The first images I captured were…terrible. Far too bright; far too blurry. In the brief second I had to think about this, I realized that the default evaluative metering mode of my camera was looking at the whole scene and deciding that the background was too dark, thus it needed to slow down the shutter speed to brighten up the scene. Nope. As smart as we’ve made our cameras, they still can’t judge what effect we’re going for. Thankfully due to the live previews of digital cameras, I was able to spin the shutter speed dial until I arrived at exactly the look I wanted. Once I saw it, I laid the hammer down on the shutter, or as photographers say, I sprayed and prayed, hoping I’d get a great shot of his rapidly changing expression. I saw the pure elation and wonder in my son’s eyes as I looked through the lens. Seconds after I captured my shots, the lights came up, and the cupcake was devoured. At this point I still wasn’t sure if I had managed to capture the perfect moment. During post, I was elated to find that not only had I captured a beautiful moment, but very little processing was needed to produce the final image. The camera settings for this shot ended up being 1/30 sec shutter, f/4 aperture, and ISO 3200. While not a “fast” shutter speed, it was fast enough to allow me to shut out the ambient light and focus on my subject. Would you believe this was only my second attempt at candlelit photography? What I really love about this image is that there is no way I could have planned an image like it with a child of that age. This was pure, honest, unrehearsed, simple joy. All it took was a simple confection to make his day. As adults, we often forget the simple joys in life and this was a perfect reminder to me to stop look at the world through a child’s eyes.